G.D. Kennedy looks back at the past year in capeless comics and picks his 13 favorites. The end of the year has crept up on us once again, and with a box filled with My Little Pony comics sitting on my desk that, to my wife’s chagrin, appeared on our doorstep instead of the copy of Watchmen: Artifact’s Edition that she ordered me for Christmas, it seems like a good time to take stock of the last year in uncaped comics, and, in particular, the 13 best new series, more or less, from 2014 (more or less), presented in no particular order other than alphabetical. Afterlife with Archie, Writer: Roberto Aguirre-Sacasa, Art: Francesco Francavilla, Archie Comics. 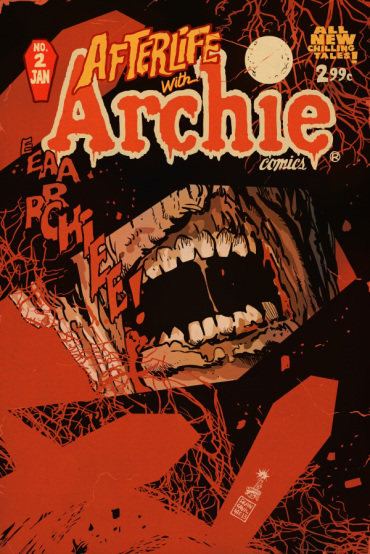 So, yes, technically Afterlife with Archie came out in 2013, but it was late in the year and all we had at that time were a couple issues, so I am cheating and I don’t care. This is an excellent series that has become everything that The Walking Dead should have been: a tale of survival in the face of the zombie apocalypse that is based less on continuous action and more on fundamentally strong characters, each of whom is unique, identifiable, relatable, and flawed. Writer Roberto Aguirre-Sacasa’s tone manages to create a sense of ominous nostalgia as it focuses on, and is frequently narrated by, different characters in the series (including a fantastic sequence told from the perspective of Archie’s dog), and often employs flashbacks to round out the characters, ultimately creating leads that we genuinely can care – and fear – for. Any accolades for this series should be extended to the Chilling Adventures of Sabrina, the spin-off horror series that is an homage to classic witch horror like Rosemary’s Baby and has emerged as a pleasant surprise when its mere existence could have signaled serious shark-jumping. Beautiful Darkness, Writer: Fabien Vehlmann, Artists: Kerascoët, Drawn & Quarterly. Though not a series, Beautiful Darkness was one of the most impressive works to come out in the last year, so it deserves mention. Written by Fabien Vehlmann and with chilling art by the husband/wife team Kerascoët, Beautiful Darkness is a haunting tale of the anthropomorphized dispersed elements of a young girl – her dreams, fears, traits and characteristics – that come spilling out of her after her lonely death in a wooded area. They take up residence in and around the base of her body and attempt to lead their lives in what becomes a sort of existential Lord of the Flies centered on the fleeting nature of life and what happens to our non-physical aspects in death. The book is heavy and somber, but also filled with moments of genuine joy and humor, and as a whole is an elegant and beautiful accomplishment. 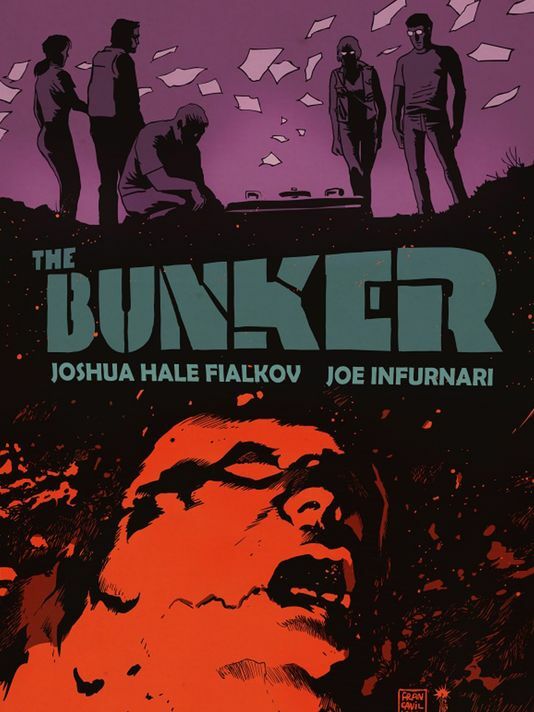 The Bunker, Writer: Joshua Hale Fialkov, Artist: Joe Infurnari, Oni Press. Maybe one of the most compelling new series of 2014, The Bunker from Oni Press is a brew of science fiction, political intrigue and moralist philosophy that plays out as a unique time-travel story. The general premise is that a group of friends stumble upon a bunker in the woods that is stuffed with information about their futures, and in particular express steps that they must take to save the world from destruction. The only caveat is that to do this, they also will be responsible for the death of a substantial portion of the Earth’s population. Joshua Hale Fialkov does an excellent job of telling the story, taking time to focus on each of the characters and not rushing their development for the sake of pushing along the story, while also transitioning the narrative between the present and the future. Maybe most effectively, the series plays on a sense of apprehension rising from a mix of both the weighty choice that the protagonists are forced to face, and the over-arching ambiguity of whether or not the ends to which the characters are being directed are genuine or contrived manipulation. D4VE, Writer: Ryan Ferrier, Artist: Valentin Ramon, Monkeybrain. What do you do when your entire purpose for living disappears overnight? 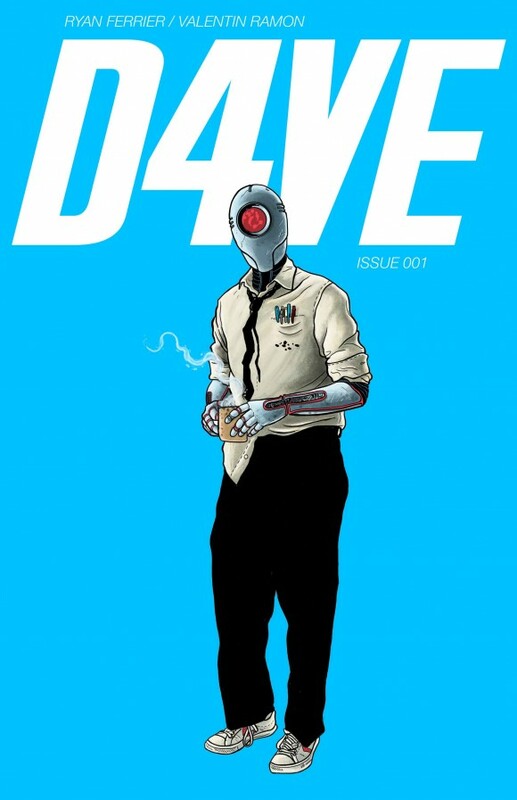 D4VE, from Monkeybrain Comics, takes a stab at answering this question, telling the story of the titular character, a defense robot in a distant future where robots rule the Earth following the eradication of humans, who finds himself adrift without any enemies to protect robotkind from. As a result, D4VE finds himself floating through a soulless desk job working under a self-important boss, forcing D4VE further into ambivalence. The book – a five-issue mini-series – has some very nice and genuine moments and, while the series certainly starts stronger than it ends, the whole body of work tells a fun and introspective story from a unique perspective. Deadly Class, Writer: Rick Remender, Artist: Wes Craig, Image. I have gone back and forth on Deadly Class, which Rick Remender and Wes Craig debuted early this year, but hindsight is a privilege and, now looking back at the first nine issues, the series has found its groove and evolved into a simply stellar work. The series focuses on Marcus Lopez, a street orphan in Reagan’s 1980s America who, through a series of occurrences, winds up as the loaner outcast in a high school that is training the world’s future elite assassins. Marcus is a fantastic character and his backstory is riveting and heartbreaking, but the series’ underlying premise – a school for teenage assassins – lends itself to the tropes of an easy teenage team series riddled with melodrama and constantly runs the risk of falling into the trap of lauding the coolness of the ’80s – skateboards, punk music, etc. After a few early missteps, Remender has done an excellent job of avoiding the pitfalls and instead makes this series an engaging read about the trials of growing up and coming to grips with your past and your future. Of course, none of this is possible without Craig’s art, which, among other things, plays with open panel space in an architectural fashion that sets the tone and pacing of the book. 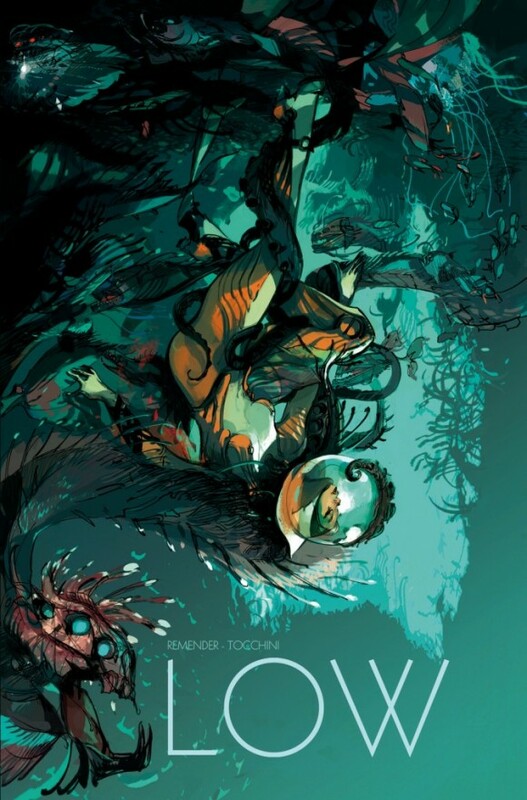 Low, Writer: Rick Remender, Artist: Greg Tocchini, Image. Remender has had a big year, and as good as Deadly Class is, Low is my favorite of his current indie books. This book is set in a dystopic future where humanity has moved underwater after the Earth’s surface has been burnt, but air is quickly running out and the species’ future looks bleak. The story follows a family’s quest to find a habitable land while they struggle to deal with the fallout of the tragic loss of the family’s patriarch, and the kidnapping of two children. The story manages to mix great sci-fi elements with a character-driven story that is so infused with optimism in the face of terrible circumstances that it quickly becomes inspiring. Add to that Greg Tocchini’s stylized artwork, which provides a nice abstract element (I completely disagree with complaints that I have read about the art — I think it is fantastic) and Low is easily one of the best books of the past year. Rasputin, Writer: Alex Grecian, Artist: Riley Rossmo, Image. I have to admit that I am biased when it comes to Riley Rossmo’s art, which vacillates from traditional comic work with a frenetic edge, to surrealist musings with a fine-art quality, but his work on Rasputin, his most-recent collaboration with best-selling author Alex Grecian, may be his best to date. The series, which offers a fictionalized account of the life of Grigori Rasputin, the ill-fated adviser to the Romanov family who was killed in the years before the Bolshevik revolution, incorporates the supernatural, spiritualism, and historical aspects of Rasputin’s life to create a weird concoction, but in Grecian and Rossmo’s hands, play off each other well to create a strangely distorted view of history. The setting — Russia and Siberia in the late 1800s and early 1900s — plays directly into Rossmo’s strengths of creating a world that is a slightly skewed version of reality, maybe standing out the most in the series’ first issue, in which Rossmo has near-free range to lay the foundation for the series, as Grecian’s dialogue is few and far between. 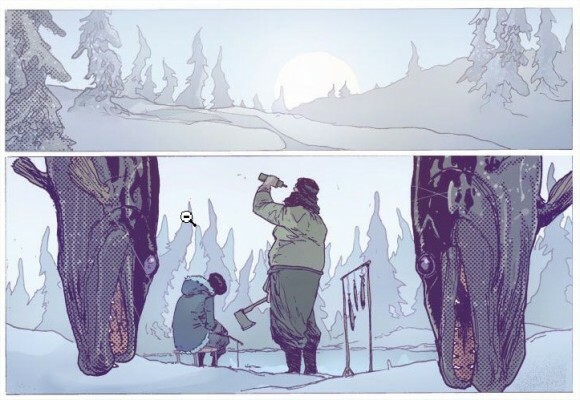 Southern Bastards, Writer: Jason Aaron, Artist: Jason Latour, Image. There are few writers who can – or at least would – take the first arc of a series to build an admirable protagonist [SPOILER AHEAD!!!] only to kill him off at the hands of the series’ wretched antagonist, and then focus the entire second arc on humanizing the villain, turning him into almost a motivated protagonist in his own right. But most writers aren’t Jason Aaron, and, like Scalped, Aaron’s fantastic series from Vertigo, Southern Bastards is more about a place – here, an impoverished Alabama town obsessed with football and besotted with crime and political corruption – and its influence on the characters than the characters themselves. Aaron can do no wrong (or at least very rarely), and a character-based story about real people and devoid of capes and hammers may be where he excels the most. Southern Bastards is strong evidence of this — and that Aaron is simply one of the best writers in the business. Spread, Writer: Justin Jordan, Artist: Kyle Strahm, Image. The first issue of Spread was one of the most impressive introductions to a new series that I’ve read in a long time. While the series hasn’t maintained its initial pace, this is more a testament to the strength of the first issue than a slight to the balance of the issues. Spread has all of the elements of a great sci-fi/horror series, borrowing heavily from John Carpenter’s The Thing and other 1970s monster horror to create a dystopic, post-apocalyptic world in which the remaining society is highly fragmented and under constant threat from a mysterious and parasitic monster from somewhere below the Earth’s crust. Basically, good things happen when Justin Jordan is given free rein to tee up on monsters and gratuitous violence, as he has an uncommon ability to build and develop characters in the midst of chaos. 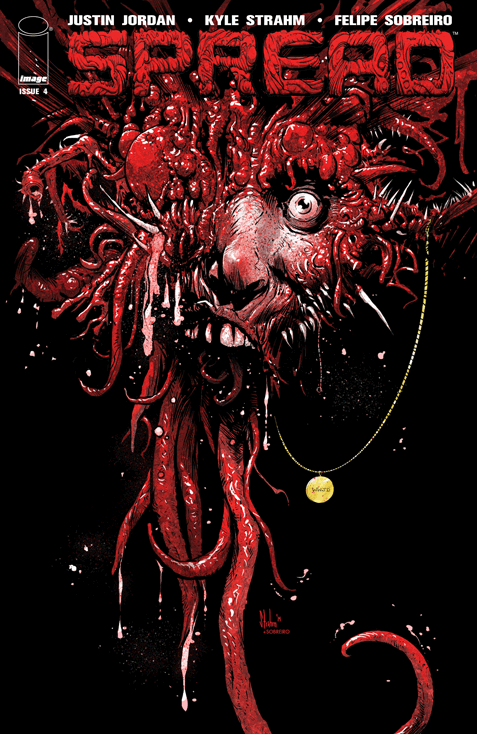 Jordan is a master of pulp and, like the Luther Strode series, Spread is gory grindhouse fun that stands as an easy mask for the fantastic world and characters throughout this series. Universe!, Writer/Artist: Albert Monteys, Panel Syndicate. Universe! is the second series released by Panel Syndicate, the digital comic site pioneered by Brian K. Vaughan and Marcos Martin as a platform for their excellent series, Private Eye. 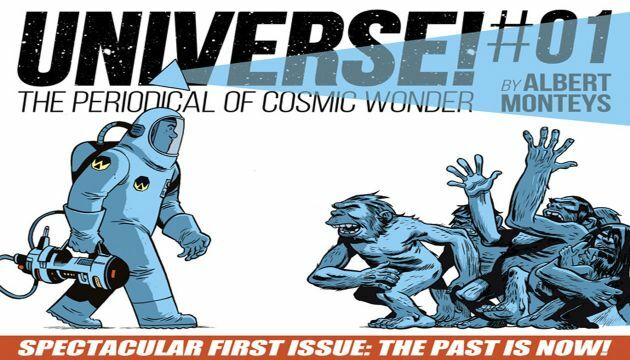 The first (and only, to date,) issue of Universe! was published in November and featured a short story that screamed of mid-century science fiction, something in the vein of Isaac Asimov or Ray Bradbury, telling the story of an unlikely time traveler who is forced to wade through billions of years of isolation with a talking robot as his only companion. And much like Bradbury’s The Illustrated Man, Albert Monteys has promised that the series will be a scattering of short stories in the very traditional science fiction mold. Wayward, Writer: Jim Zub, Artist: Steve Cummings, Image. This is a book that has consistently surprised because, despite being somewhat outside my traditional bailiwick, I keep coming back to it and find myself even looking forward to it each month. Jim Zub’s tale of a displaced Irish/Japanese teenager living in Tokyo and discovering a hidden mystical world filled with ancient and evil spirits is nothing less than addictive. Rori Lane, the books’ protagonist, is infinitely likable and Steve Cummings’ art manages to capture the subtlety of Japan in a manner that is rarely, if ever, seen in a Western comic. The Woods, Writer: James Tynion IV, Artist: Michael Dialynas, Boom! Studios. The Woods is a series that has grown on me more with each issue, a weird little story about a school that is transported from present day USA. to a strange wooded area on some strange alien world that is filled with dangerous creatures, odd warriors, and bizarre temples. James Tynion IV has managed to create a story that is beset with mystery — about the world on which the school has been transported, about how it was transported, and why — that is allowed to play itself out without dragging the story down, or unnecessarily out. Natural comparisons may be made to Morning Glories, another mystery centered around a strange high school, but where Morning Glories can become heavy with the riddles that it weaves through (and which, at times, it seems only the author understands and/or cares about), The Woods manages to remain a fun story that continues to move forward while the mystery only continues to widen. 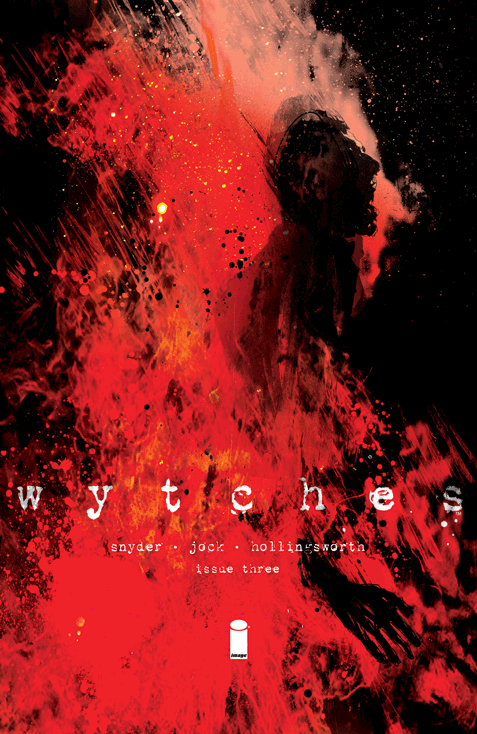 Wytches, Writer: Scott Snyder, Art: Jock, Image. After only three issues, Wytches has been one of the most impressive books, one of those rare comics that bring you back to being a kid, waiting for it to hit the shelves each month. Creating a comic that is actually scary is challenging and few creators effectively do so, but Scott Snyder and Jock have managed to produce a haunting psychological tale that is based on well-rounded, relatable characters who are quickly falling down a rabbit hole of unknown horrors. There is a very palpable sense of confusion, of terror lurking just outside of the periphery but omnipresent, and of claustrophobia that makes this such a compelling read. Appropriate credit must also by given to Matt Hollingsworth on the colors, who utilizes a splatter-paint technique that adds a frenetic element to even the most straightforward scene.